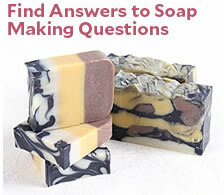 ONE: Melt 16 ounces of white soap base in the microwave and mix in ½ ounce of Cherry Pop Fragrance Oil. 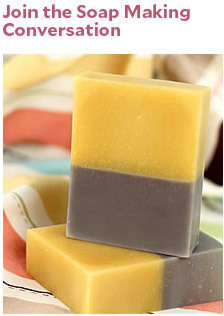 TWO: Separate the scented soap evenly into two containers or mugs. 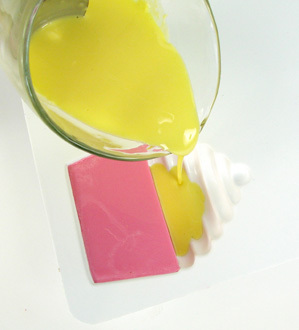 Add the canary colorant to one container of soap and the cherry colorant to the other. Just a couple of drops of undiluted color will do the trick. Mix both well. 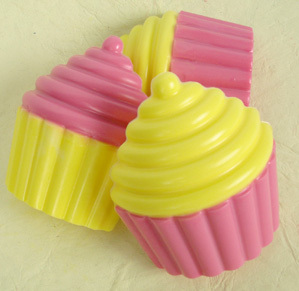 THREE: Fill up two cupcake cavities with the yellow soap and the other 2 cupcake cavities with the pink soap. Spritz with rubbing alcohol to eliminate air bubbles and let the soaps cool for about 2-4 hours. 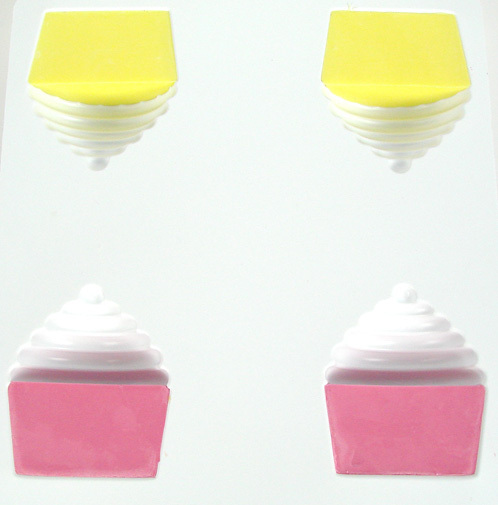 FOUR: Once the soaps have cooled, remove them from the mold and carefully cut off the frosting parts of each cupcake. Then cut the yellow frosting tops into small chunks and melt the soap back down in the microwave. Repeat with the pink soap. 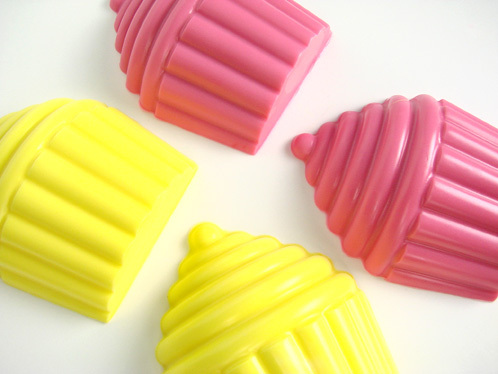 SIX: While the pink and yellow soaps are in the microwave, place all of the cupcake bottoms back into the mold and firmly press them down. SEVEN: Once the pink and yellow soap is melted and isn’t so hot that it’s steaming (don’t want it to melt the cuppy base), spray the cupcake bottoms with rubbing alcohol (to ensure that the layers stick together) and fill up the frosting part of each cavity mixing and matching colors. Pink cupcake bottoms get yellow frosting and yellow cupcake bottoms get pink frosting. Give the soaps a final spritz with rubbing alcohol to eliminate air bubbles and let cool. Pop out after a thorough cool down (usually 6 to 8 hours).